New Zealand's world individual time trial champion Linda Villumsen describes her victory in Richmond, Virginia as "incredible". The 30-year-old edged Dutch rider Anna van der Breggen and defending champion Lisa Brennauer into second and third places respectively. 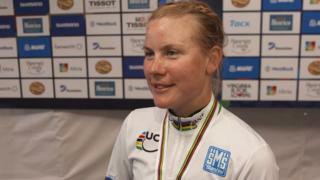 Villumsen says "no words can describe" her joy at claiming the world title. Watch live coverage of the World Road Championships 2015 from Richmond, Virginia, USA, on the Red Button from Tuesday, 22 September.